Lindsey was first introduced to yoga in 2002 while enrolled in yoga studies at her university. Since that time, she has practiced asana at many studios in a variety of styles lead by excellent teachers. Lindsey has developed a consistent home practice that incorporates asana, pranayama, meditation, study and self-inquiry, beginning a transformational journey toward living a wholehearted life. Lindsey completed a 200hr hatha yoga teaching program at Sunshine Yoga, Destin in 2018 so she could share her passion for yoga with others. Her classes are a balance of energizing movement, peaceful stillness, strength and ease, joy and introspection. 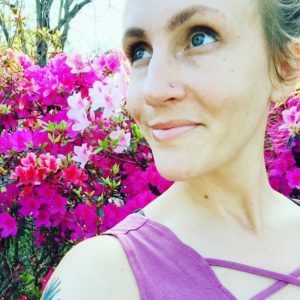 Lindsey is passionate about creating an inclusive yoga community, exploring personal anatomy for healing and health, incorporating all 8 limbs into the practice and utilizing yoga as a tool for mindfulness, growth and awakening to the truest parts of ourselves. Other joyful pursuits include hiking, camping, swimming, gardening, travel, plant based eating, creative projects and motherhood.